Recently, I had the chance to play with a BlackBerry. For most telcos, I believe you can do a one to one exchange, but what if you need to backup your data and it’s 3am at night? You can attempt to fix it yourself before deciding to wipe it. Using this method, it is possible to access your BlackBerry while the screen shows the dreaded JVM Error 102 / infinite reset screen. Install the BlackBerry Desktop application if you have not done so, you should have an installation cd which comes with your BlackBerry or you can download it from here. 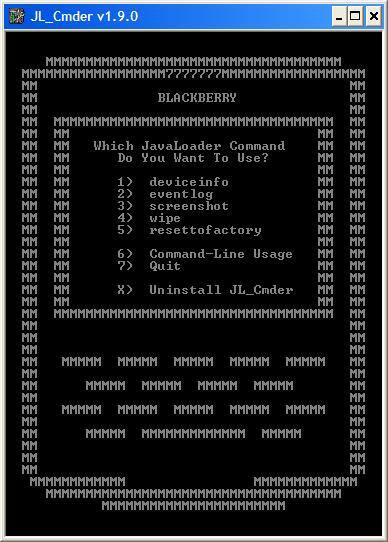 Download the JL_Cmder JavaLoader Utility from blackberryfreaks. For debugging purposes, you can select eventlog (option 2). This will dump the eventlog from the phone, onto notepad for you to view through. Look through the last few lines where it says “error” or “failed”. If it doesn’t you have the option of wiping your BlackBerry (option 4), or resettofactory (option 5).